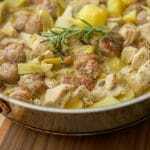 Skillet Chicken, Sausage, Artichokes and Potatoes made on top of the stove with sausage, chicken, artichoke hearts and potatoes in a white wine sauce. Heat your oil in a large skillet on top of the stove. Cut the sausage links into bite sized pieces (I got 6 pieces per link) and brown the sausage until it's almost cooked through; then remove from the pan and set aside. Next, your diced chicken into the pan and cook that until it's cooked through. This step takes approximately 15 minutes. Next, add chopped scallions, garlic, fresh rosemary and saute for 1-2 minutes; then add potatoes that have been peeled and cut into quarters, artichoke hearts, white wine and chicken broth. Finally, add the sausage back into the pan, cover the pan with a lid, reduce heat to low and simmer for 30 minutes or until your potatoes are fork tender.